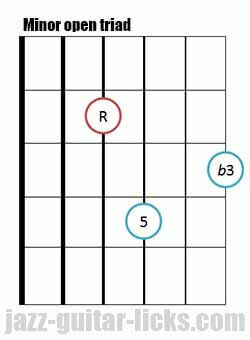 Minor triads are constructed by stacking the root, the major third and the perfect fifth of a minor scale. 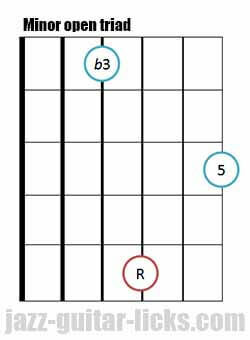 As it is shown in the chart below, an A minor triad is made up of A (root), C (minor third) and E (perfect fifth). 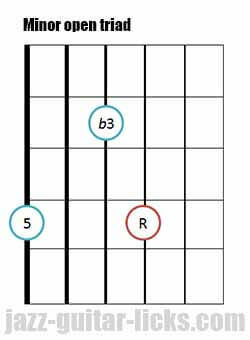 In comparison with the major triad chords, the third is lowered by a semitone. 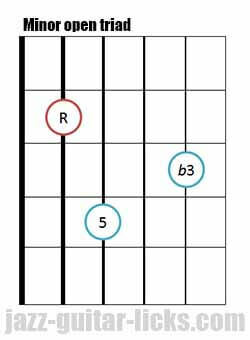 Before starting exploring minor triad chords, you have to know that an inverted chord is a chord whose notes are arranged in a different order. 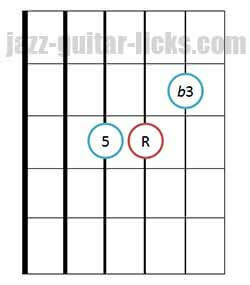 That means that the bass can be the third or the fifth instead of the usual root note, thus giving different voicings. 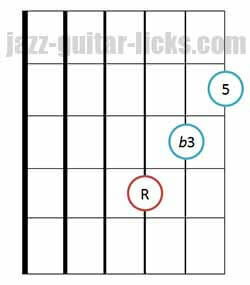 You will find below, 12 guitar diagrams containing four root positions. 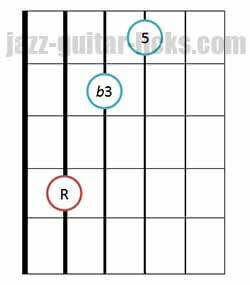 Each root position is related to two inverted positions with the third or the fifth in the bass. 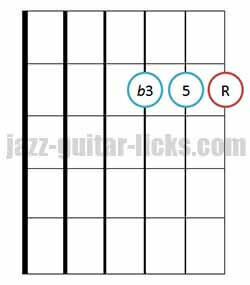 That gives 12 closed positions to play the same minor triad. 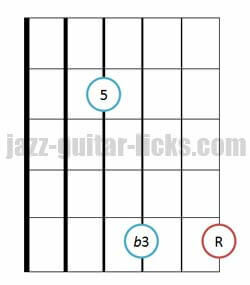 Remember that closed guitar chords are those where the root position, and all inversions, fit within the space of one octave. 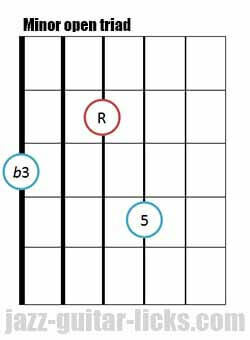 Here are three guitar diagrams to play minor triads with the bass on the sixth string. 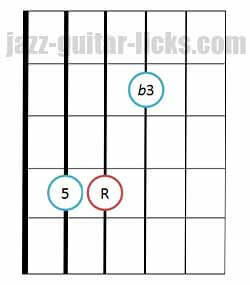 The following minor triad chord diagrams have their basses on the fifth string. 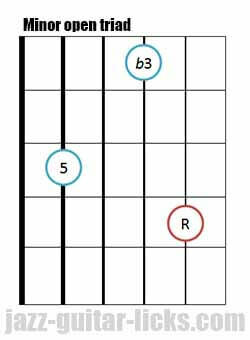 The following diagrams have their basses on the fourth string. 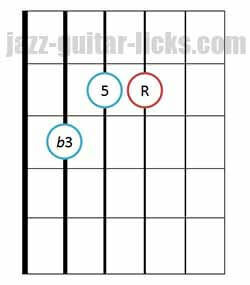 Here are 3 last positions which have their basses on the third string. 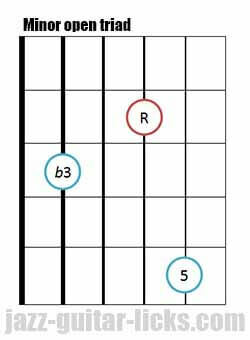 As it is explained previously, minor triads are built with 3 notes. 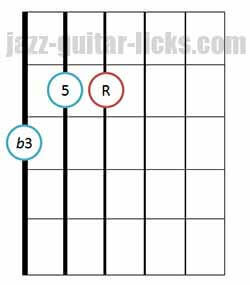 A root (1), a minor third (b3) and a perfect fifth. There can be open or closed voiced triads whatever they are (minor, major, diminished and augmented). 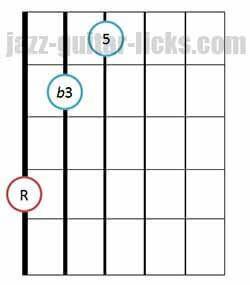 Open voiced triads provide a great way to expand your chord vocabulary. 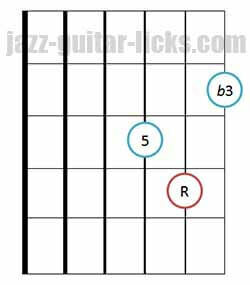 They are very useful for comping, composing or chord melody. Closed voicings : The notes are as close together as possible, all included in one octave. 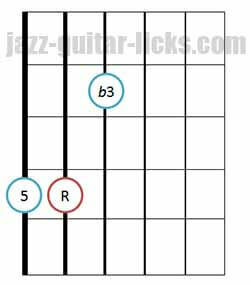 Open voicings : The notes are spread over more than an octave. An open voiced triad is built by moving the middle note of a closed voicing up on octave. 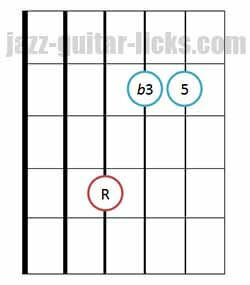 Let's take an example with a C minor triad (close voicing). It is built with C, the root, Eb the minor third and G, the fifth. To build a open voicing, you have to move the middle note that is Eb an octave up. 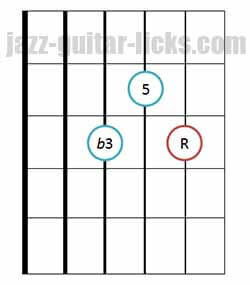 This way you get a new voicing : C (Root), G (fifth), Eb (minor third). 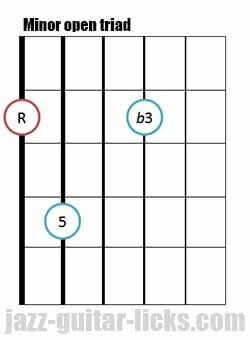 Now you can repeat this operation with the two inverted closed minor triads to obtain two other opened minor triad voicings.